If you’re in the Kololo area and need an afternoon pick-me-up or simply a shopping break, stop by the new Kampala Fair store near the Kisementi Shopping Center. The lively colours are sure to draw you in and put a smile on your face! To further sweeten the deal, they share their new space with Good Glass, another local favorite. I had a chance to interview the two owners of Kampala Fair and see their new store, which opened in early September. Mette teamed up with co-owner Louise Graymore from the UK who serves as the business brains behind the clothing and interior line and together they operate this unique, fair-trade business. Everything in the Kampala Fair store is locally made. 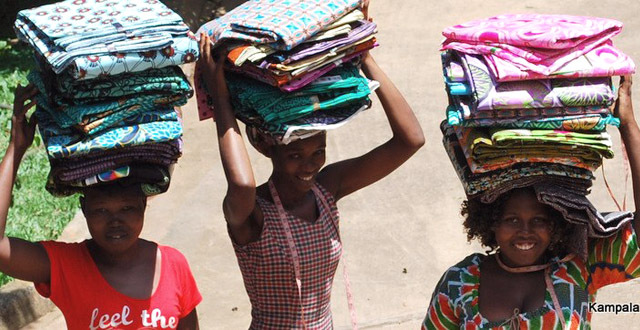 All of the vibrant fabrics are purchased right here in downtown Kampala and then brought to life by their staff of five tailors and five rug makers. Their items are also sold in the MishMash shop. Though, the new store has a much larger selection. Take my word for it: You simply must stop in and see this space! All of the lovely white woodwork was custom designed by Canadian craftsman Kevin Sutton and the setting makes for an incredible shopping experience. Everything is neatly organized by style and the dressing room is certainly the largest and ahem… cleanest… in all of Kampala! In addition to their children’s line, they also carry women’s wear and home goods such as cushion covers and colorful crocheted rugs. I found this to be a fun detail: Many of the women’s dresses are inspired by and named after specific women. They have the classic “Doris” dress, named after Doris Day, and their “Sophia” dress, named and inspired by Sophia Loren, is their bestseller! I even hopped in the dressing room to check out a few of the styles and am now a huge fan of the “Angelique Bow Dress” in maxi length. Sizing is in European sizes, although the staff is also knowledgeable in US and other foreign sizing charts. There are at least six different sizes of everything in the store and their helpful staff will help you find the perfect fit! Their tailors are also available to assist with minor alterations. All fabrics are pre-washed and won’t fade after you’ve purchased them. 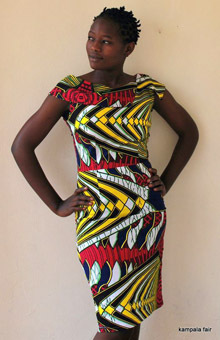 Kampala Fair is not just another African craft and clothing store. They are producing absolutely lovely items for your closet or home that you can enjoy with a clear conscience. This business creates well-designed products that bring pride to Uganda while providing jobs that treat employees with respect and dignity. Kampala Fair’s products are enjoyed by customers from over 50 countries such as Brazil, Japan, India, and even tiny East Timor to name a few! For those of you outside of the Kampala area, you can shop online at http://www.kampalafair.com or find their items through medium to high-end partner stores and distributors in Kenya, UK, Denmark, Finland, and Sweden or a few select online shops. See their website for more details.